Looking for a way to use up that leftover spaghetti pasta? Here’s a trick - combine it with VELVEETA, cooked chicken, pasta sauce, and Parmesan and bake it in the oven. 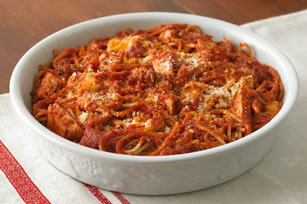 This chicken and pasta casserole is a great way to use up on-hand ingredients! Place spaghetti, Velveeta, chicken and sauce in resealable plastic bag; seal bag. Shake bag and press with hands until spaghetti is evenly coated with remaining ingredients; press into 9-inch pie plate sprayed with cooking spray. Bake 15 to 20 min. or until heated through. Let stand 5 min. before serving. Prepare using multi-grain or whole wheat spaghetti. Substitute 8-inch square baking dish for the pie plate.